We have collected a lot of coconut milk and almond milk cartons. A lot! We do always recycle our packaging but I prefer giving a new life to our leftovers so I did some research into projects we could do to make good use of them. I went on to my favourite Pinterest and found this fantastic pin which ended my search. Pops love, love, loves owls and because Fin loves everything Pops loves he was as excited as she was about this craft. First of all I cut out the holes and wings with a sharp kitchen knife. Then I cleaned out the cartons with soapy water. (It was much easier to do this after I’d made the holes.) With hignsight I would have painted these bad boys white before getting the kids to use colour as it would have covered up the writing on the cartons but with all 3 of us being impatient we decided to crack on regardless. I asked them what colours they wanted and then made up an equal mix of poster paint and gloopy glue and then they began their works of art! 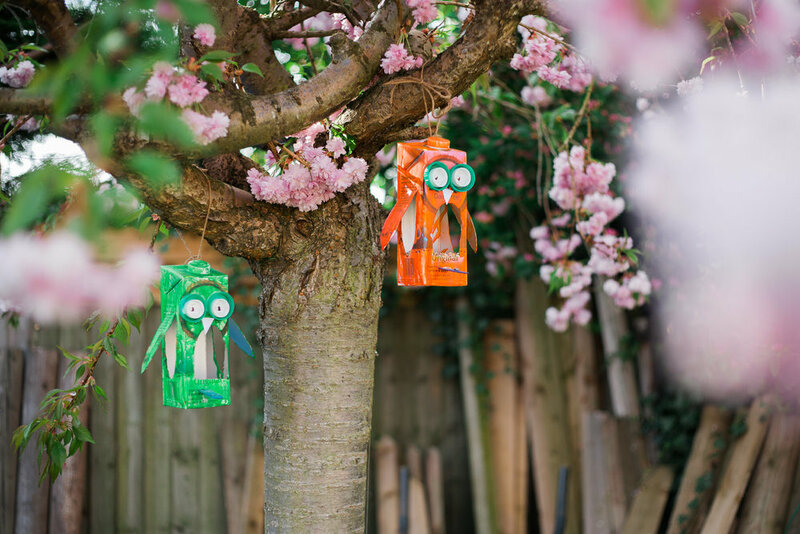 They now hang beautifully in our cherry blossom tree. Bring on the bird watching!